Numerous third-party commercial ads and annoying pop-ups within your web browser is the primary indication that an adware program is active on your operating system. The ad-supported program in question could be Super Great. Like a lot of other adware applications, this one is also advertised as a tool that should help you improve your online experience. At first such statements might sound great, but you must know that they are used as a hoax marketing strategy to lure unsuspecting users into downloading and installing an application, which, in fact, is utterly worthless. Do not get fooled by such devious advertising of this adware and make sure to stay away from it at all times. Since Super Great does not hold any valuable features, we strongly advise every user to remove it as soon as possible. You can do so by following the removal guide that we provide below. Read the rest of this article and learn more about this intrusive program and why its removal is imperative. In most cases Super Great functions in a rather simple way. Like so many of its counterparts this invasive add-supported program will flood your web browser with a ton of unwanted and annoying third-party web content, which is usually presented to you as various banner ads, coupons and pop-ups. This is so because the intrusive adware program is able to connect to various adware servers, which are the main source of all the annoying ads and pop-ups. Such connections are possible since this adware inserts files into your operating system, which are designed to do that. The most annoying thing about this activity is that in the majority of cases third-party commercial ads and pop-ups will be presented to you in an utterly random way, on random websites, at random times. 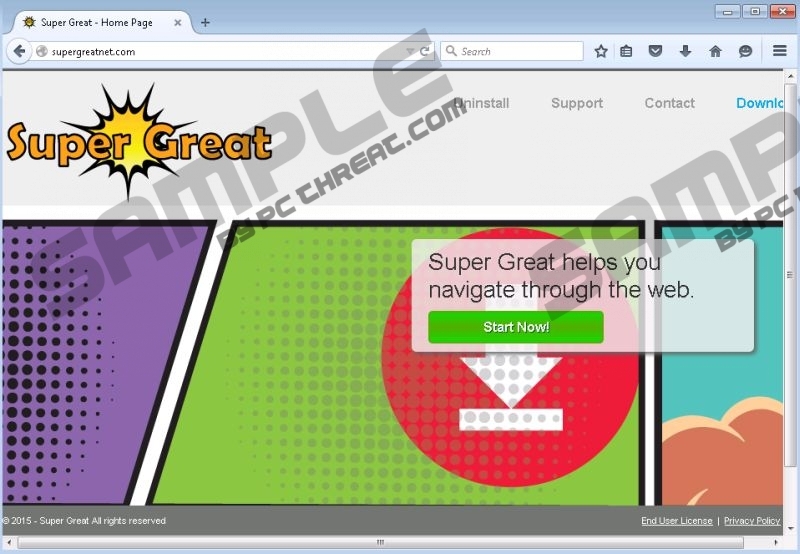 In fact as long as Super Great is active on your PC you will not be able to surf the web in the way you are used to. Make sure to carefully follow the removal guide below to get rid of Super Great completely; otherwise the ads and pop-ups will continue to bother you. It is also important to note that it is impossible to download Super Great from its official website since the direct download link does not function. This means that in most cases this ad-supported program is spread via software bundles. Make sure to avoid all third-party download websites at all times since they are widely known to provide bundled installers. Also, make sure to find out as much as possible about the program you want to install before actually doing so because other adware programs also use devious marketing strategies. Of course, your best bet is to keep your PC clean and secure at all times is by installing a professional antimalware tool since it provides overall system security at all times. The removal of Super Great is rather simple, but you should still pay your utmost attention while conducting it because a mistake could signify that the infectious program was not removed entirely. If you wish to be sure that every single bit of Super Great has been deleted from your operating system, please scan your computer with a reliable malware detection and removal tool once the manual removal has been executed. Locate and select Super Great. Quick & tested solution for Super Great removal.